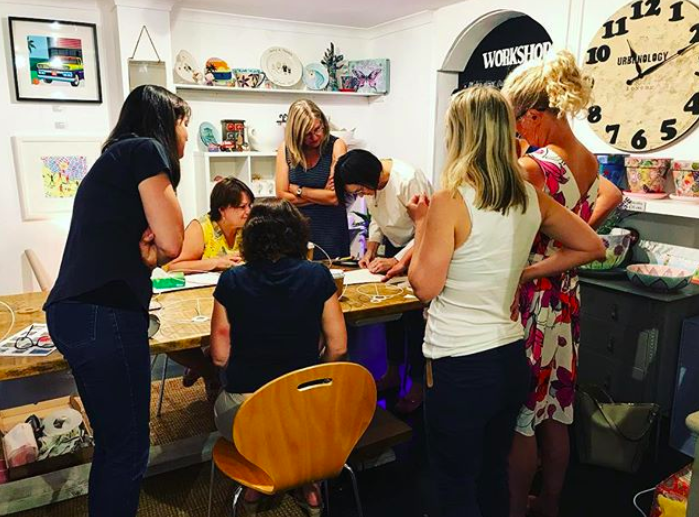 Since opening our new workshop and gallery space last month it has been bustling with so many creative people, and it's so nice to see everyone willing to share their knowledge. We've come a long way from only having one or two workshops running a year to now having around four or five a month. Not being blessed with the most creative side I am absolutely in awe of our workshop hosts, I had no idea there were so many different workshops out there. I absolutely LOVE the concept of everyone wanting to learn and develop their own skills - taking on a real DIY approach to life. Even if you are as useless as I am when it comes to doing anything (that really is anything - I need help, A LOT!) our lovely workshop gals are on hand to guide you every step of the way. From the fantastic Beatrice and Clementine spilling some of Annie Sloan's best kept secrets (of painting furniture that is…) to the super talented Ros showing us how to create a beautiful ceramic hare sculpture out of clay, there is so much scope and opportunity to build on your own abilities. We have so many exciting workshops heading your way and have even managed to plan a wreath making and a Christmas cracker workshop in December with @shoprosewillow, (yes, I know it's only July, but its never too early for Christmas....right?!) There are such a wide range of workshops on offer that I can guarantee at least one will take your fancy! In October and November we have Jewellery Workshops allowing you to show off your own creations of silver clay jewellery, stacking rings or both if you're feeling extra creative. No more searching for that perfect piece to complete an outfit, you'll be able to make it yourself with these workshops. Even though the workshops may initially seem expensive to some, you have to think not only of the end product, but the fact that you will have that knowledge forever. For example, have you ever bought a homemade lampshade from Etsy? They can range from £30-£100+ which seems ludicrous considering Bernie from @rixinteriors is only charging £45pp for her lampshade making course with equipment and lunch included. We know sometimes it all comes down to timing and convenience, but even if you only make a few lampshades now and then you are already saving yourself money. You never know when learning a new technique will come in handy - say for example you attended our Beginners Guide to Modern Calligraphy with Emerald Paper Design in October and then got engaged in November you could do all your own name settings, table numbers etc. yourself! Who's to say that with your newfound skill you can't go and start up your own business? I'll leave you to have a think about that one. All our workshops include refreshments provided by our Bonds café. Depending on how long the workshops run you will either have lunch or a selection of delicious cakes. We want to make sure that you have a great experience and not only get the opportunity to learn but be able to socialise with other creative individuals. ‍How cute are these needle felted brooches? Our workshops are mainly for beginners as there is a higher demand for beginner classes. However if you have attended a beginner's class and are looking to advance to the next step or learn something similar using the same technique, we will always try where we can to run a workshop for you. At the moment for the Annie Sloan classes we have Essential Chalk Painting Techniques One and you can book for Chalk Painting Techniques Two either on the same day or different days. 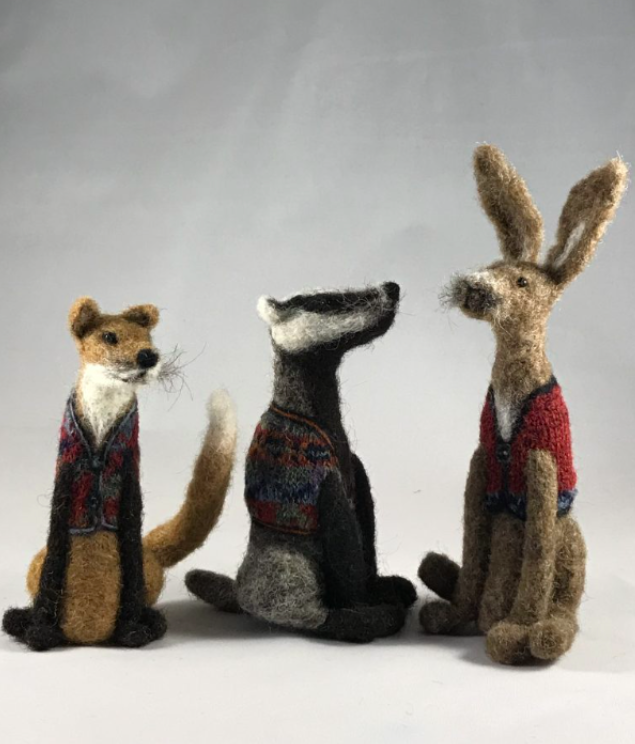 Even though both our needle felting courses are for beginners you can try out Crafty Gal's taster class making needle felted brooches, but then advance if you fancy to the other longer class on another day. We will always mix up the workshops where we can, ensuring that it is kept fresh and interesting. If you don't fancy the workshops yourself but want to send your kids to get creative in the summer holidays the lovely Nina from @creativespiritstudio will be on hand to ensure that they will be entertained for hours on end. 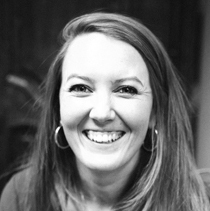 Specialising in teaching the art of pottery painting, Nina has years of knowledge behind her and will ensure that your child will be working in a fun and safe environment. Using various mixed-media art techniques, not only will there be a wide selection of ceramics to paint, but also the chance to try decoupage, painting on canvas, creating collages, fabric painting and many more. For more information on dates and timings send Nina an email via; info@creativespiritstudio.uk. If you would like to see what workshops are coming up month by month then check out our events page on the website, head over to our Instagram page where we will update weekly on workshops or ping us over an email and we can give you the entire list of workshops up until December. Don't forget you can either book workshops with our hosts on their various event pages, or give us a call on 01789 297 729 and pay over the phone or at our till. Frankie joined Bonds in 2015 and has taken over the social media side of things, gaining a huge following.